Been There, Doon That: Bonny Doon’s Randall Grahm was born to Rhone. Randall Grahm is my favorite wine conjuror. To call him a mere winemaker, although that is an essential page of his vitae, is like calling Bruce Springsteen a singer: factually true, but only part of the story. Since the early ’80s, Grahm’s Bonny Doon Vineyard has given us provocative, Rhone-style (mostly) wines from (mostly) California. But again, that’s not the entire story. Grahm is also largely responsible for putting fun into wine drinking, something the enterprise largely lacked until he let the genie out of the wine bottle. Bonny Doon wines have, as long as I can recall, been a value-added phenomena. Sure, you pay for the tasty stuff in the bottle. But, with Bonny Doon, in addition to well-made juice, you also get entertainment. How often do you look forward to reading a good bottle of wine? Well, thanks to Grahm’s laser-like wit, self-deprecating humor and mastery of language, with each and every bottle of Bonny Doon vino you also get a great read. In fact, one might buy Bonny Doon for the labels alone, and consider what’s in the bottle to be merely a bonus. Grahm’s influences seem to range from philosophers like Descartes and Sartre to writers Hunter S. Thompson and Dave Barry. His new book is dedicated to John Locke. Most of my correspondence with Grahm has been not about wine, but about the liqueur French Chartreuse, something we both share an affinity for. When his classic Citroen recently began leaking green fluid, I suggested it may have been dripping Chartreuse, a notion he’d already discussed with his mechanic. Chartreuse madness aside, I feel like I know Grahm. He’s certainly not shy about expressing his opinions on winemaking, philosophy, food and just about every other topic under the sun, and has done so for years in his Bonny Doon “nooseletters,” via his wine labels and, more recently, online and via Facebook and Twitter. 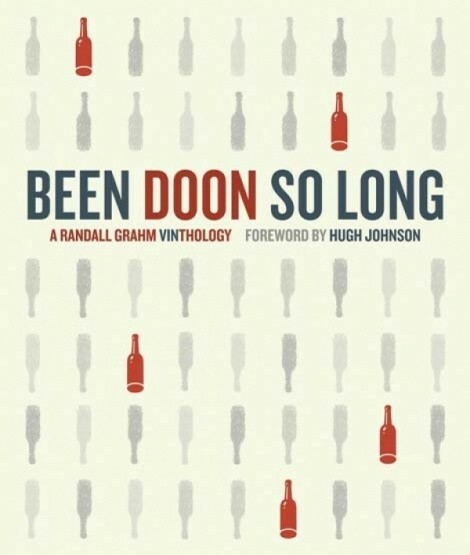 But, if you really want to get a bead on the mind of the man dubbed the “Rhone Ranger,” you’ll want to tuck into a copy of Been Doon So Long: A Randall Grahm Vinthology. This wide-ranging celebration of wine and words, a compendium of Grahm’s writings through the years is, quite simply, like world-class Pinot Noir: It’ll make you think, all the while grinning stupidly from ear to ear. Although I imagine he feels a little twinge of guilt about this, Grahm virtually invented modern wine marketing, including enlisting the great Ralph Steadman to illustrate his labels. Today, we see cute critters on wine bottle labels everywhere, along with clever names for the wines, amusing descriptions and other schemes for distracting us from what’s actually inside the bottle—which, more often than not, is plonk. The difference with Bonny Doon is that the wine is every bit as enchanting as the label’s prose—which is really saying something, given Grahm’s wonderful way with words. Occasional angst, yes, but most of all there is gut-busting humor here, high satire like “The Heartbreak of Wine Geekdom: Ten Ways You Know You’ve Met a Real Wine Geek.” Been Doon So Long—just Doon it.